HENRY PRIESTLEY. He is the earliest Priestley we can definitely claim for the family. Newchurch is on the southern edge of the Forest of Rossendale in Lancashire, halfway between Rawtenstall and Bacup. It grew up around the church built there in 1511. Baptism. Newchurch in Rossendale. Bishop’s Transcripts. 1663 April 20 George Priestley son of Henry Priestley. The surviving Newchurch registers are incomplete. We only know of George’s baptism through the Bishops Transcripts, but they too have serious gaps. If George is Henry Priestley’s first son, then it is likely that Henry was born in the late 1630s. We have found only one earlier record of the Priestleys in the Newchurch registers. 1641/2 Feb 27, Marie, daughter of Henericus Priestley of Dedwinclough. This was just before the outbreak of the Civil War. Deadwen Clough is a hamlet on the River Irwell, just west of Newchurch village. The 21-year gap between Marie’s baptism and George’s suggests that the father is an older Henry Priestley. The surviving Newchurch registers show no further baptism entries for children of Henry Priestley of Deadwen Clough, but there are likely to have been others. It is possible that George’s father Henry is the son of this older Henry Priestley, and that he grew up in Deadwen Clough. There is, however, some uncertainty. There appear to be two Henry Priestleys having children in Newchurch in the 1660s. The 1641/2 Protestation Returns for Newchurch show no Priestleys. But we do have Robert and Henry Hey living in Deadwen Clough. Later this century we find the surname Priestley alias Hey. Robert Hey could be the father of this older Henry. Or, if the two Heys were of the same generation, then Robert Hey could be an alternative for the father of the younger Henry Priestley. Henry junior’s mother may be Ann, wife of Henry Priestley. We learn about her for the first time at her burial in Dec 1674. We have no information about Robert’s wife, making it more likely that he was of an older generation. Across England, those engaged in the wool trade were usually on the side of Parliament in the Civil War. George became a weaver, and this may have been Henry’s trade. In the early 16th century, Robert Priestley was also a weaver in this area. If, as seems likely, George was Henry’s first son, then Henry was probably too young to fight in the war of 1642-9, but it is likely that he followed news of the fighting with boyish enthusiasm and that his family cheered Cromwell’s victory. We do not have a record of this younger Henry’s marriage. It is likely to have been around 1662. George was baptised three years after the Restoration of Charles II following the Civil War and the republican Commonwealth. In the same year, 1663, the wife of another Henry Priestley, living in Pendle on the other side of Rossendale Forest, was one of group of women accused of witchcraft. The case rested on the evidence of a boy who later admitted to being bribed. They did not suffer the fate of an earlier group of Pendle women who were hanged for witchcraft in 1612. It is difficult to distinguish between the two Henry Priestleys raising a family in Newchurch in the latter half of the 17th century. Findmypast gives the baptism in Aug 1663 of Henry, son of Henry Priestley. This is taken from an index of births and baptisms, and does not appear on the Lancashire Online Parish Clerks site. If it is correct, and there is not a transcription error, then the 4-month gap following George’s baptism suggests two different fathers. In 1676 we have the baptism of Henricus, son of Henry Preistley of Whitewellbottom. Unless the earlier baby died, the two little Henrys are unlikely to have had the same father. Since George’s father was not the father of the earlier baby Henry, he must be Henry Priestley of Whitewellbottom. Whitewell Bottom lies on the lower reaches of the Whitewell Brook, shortly before it joins the River Irwell at Waterfoot. Our belief that this is where George’s family lived is strengthened by the fact that the adult George lived at Foxhill, less than ½ a mile from Whitewell Bottom. 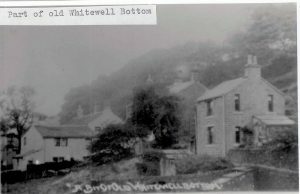 At this time Whitewell Bottom consisted of just a few scattered cottages. The photograph shows the steepness of the valley side. This leaves us in some doubt over the number of our Henry Priestley’s children. Burial. 1675/6 Mar 20 Ellin, wife of Henry Preestley. At first sight, this looks very much like the wife of Henry Priestley of Whitewellbottom dying after childbirth, but the baptisms for this Henry continue. 1676 John son of Henry Priestly of Whitwellbottom. We do not have the exact date, so we do not know how this fits into the story. There are two possible baptism for Ellin in Newchurch. 1640/1 Jan 31 Ellen fil Johis Bulcocke of Cowpe. 1641 May 21 Ellin? Fil Willim Langworgh of Cowp. Her death is followed by a marriage. Marriage. 1677 Apr 16. Henricus Preistley alias Hey and Ann Baxenden. This Henry could be the husband of Ellin, who died a year earlier, or he may be another Henry. 1678 Oct 6 James fil Henry Priestley of Wolfenden. 1680 Nov 21 Henry fil Henry Preistley. We cannot be sure whether Henry Priestley alias Hey was the father of either these children. The alias recurs in the next generation. 1698/9 Mar 5 James fil John Preistley alias Hey. Since both Henry Priestleys appear to have had a son named John in the 1670s, this does not help us to decide which of them had this alias. It is possible that they both did. The older John, born in 1672, and not said to be of Whitewell Bottom, is perhaps the more likely father. James’s baptism is followed by a sister Ann Priestley alias Hey in 1709. The family were then living in Stackhills. This is probably Staghills, which is between Waterfoot and Whitewell Bottom. There are other baptisms for children of John Priestley which do not use the alias but some may be the same man. They have addresses in Newchurch (1696), Boothfold (1702), Stackhills (1707), Newchurch (1714). People move, and the distances are small, so the evidence for two distinct families is inconclusive. Ann, wife of Henry Priestley, died in 1700. 1699/1700 Feb 19 An uxor Henrici Preistley of Newchurch. If this is Ann Baxenden, who married Henry Priestley alias Hey in 1677, then it would appear that they were not then living in Whitewell Bottom. One of the Henry Priestleys died in 1709. He, like John Priestley alias Hey a month later, was living in Stakehiles, or Staghills. 1708/9 Feb 10 Henry Priestley, Senex, of Stakehiles. Henry would probably have been approaching 80, and would qualify for the term “Senex” which means an old man. He had probably moved to live with his son John, and may previously have been living in Whitewell Bottom. There is a great deal of uncertainty here. When a scan of the registers becomes available, it may be possible to find greater clarity. If the baptism of Henry son of Henry Priestley in 1663 cannot be substantiated, then there may be only one Henry Priestley in this generation. This is the only instance of overlapping baptisms, and was not taken from the register. If so, then Henry Priestley of Deadwin Clough is almost certainly his father. His first wife would be Ellin, and the likely mother of George, and his second Ann Baxenden. BMDs from Findmypast and Lancashire OnLine Parish Clerks.